Classic rule: the more ridiculous the game, the more ridiculous the mods. Ark: Survival Evolved is about riding dinosaurs around a prehistoric Earth while simultaneously giant laserbeams shoot up into the sky. Naturally, its mods set it on the Moon with all the dinosaurs replaced with skeletal versions of themselves, or have you harvesting dino-souls in waves to summon help, or add a giant, angry gorilla as an equally tameable, rideable companion. This is just some of the highlights from the modding competition that has been underway for the last few months and has now entered its final stage – a community and developer vote to determine which mods will receive their share of prize money, fame and glory. For more on this theme, here’s the best Minecraft mods. Three categories split the voting between total conversions, maps and standard mods. 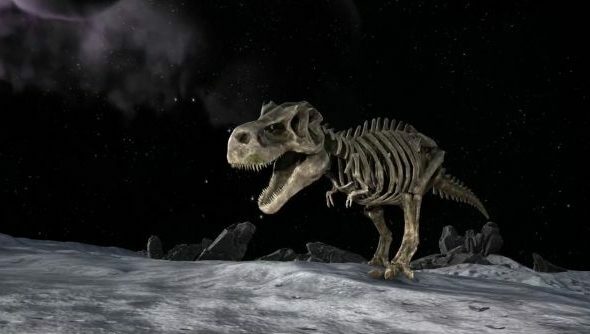 The most interesting stuff is in the total conversion category, like the currently-leading Ark: Moon Survival which adds the afore-mentioned undead Moon-dinos. There’s also Tribe Wars, a dedicated team-based PvP mode with faster progression to get folks into the fight more easily, designed to be a little time-friendlier for actual competitive play. Otherworld adds wave survival and associated mechanics for solo or co-op play, while you can probably guess the main focus of Cool 15 New Creatures. Voting is taking place on the official forums, you need an active account there with 30 posts to have an impact. In the other categories, maps is a two-horse race between a pair of exceptionally beautiful bits of craftsmanship, the verticality-focused and lava-flowing Center and the humongous Valhalla. The Center’s collection of strange locales and otherworldly areas takes it for me personally. Finally the mods section is a fairly close affair between a number of different picks, outside of clear front-runner Advanced Architecture. This is a combined building mod and royalty-sim, letting you construct a castle and rule over your friends and countrymen. It also adds some simpler crafting options for tribes or individuals with the massive amount of resources required to construct these humongous items in the first place. Also, there’s a mod called Pimp My Dino. Just putting it out there. Voting closes some time before the winners announcement on May 15. The winner of each category will receive $10,000, determined 40% by public vote and 60% by the developers. There’s also payouts to top five in each category, each in the four-figure range – a great way to kickstart the modding scene. Read a bit more about it over in the announcement post.